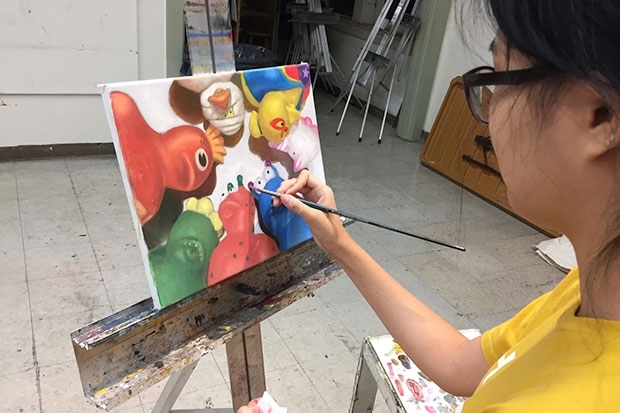 Earlier this month, Honolulu Museum of Art School teacher Jim Goodman received an email from Hye Eun Park, a senior at Moanalua High School. The young artist created her painting in Goodman’s Painting I and II class, offered every semester. She also won prizes for two other works, and they are all on view in the 55th Annual Hawai‘i Regional Scholastic Student Art Awards exhibition at the Hawai‘i State Art Museum, through April 13. Park will also be recognized at the official awards ceremony on March 17. The show features artwork by middle and high school students from across the state. And included is Park’s Rubber Ducks, a painting depicting seven costumed variations of the iconic bath toy in bold primary colors. Interested in enrolling at the Art School? See the current spring class schedule online. Registration for summer semester begins April 10. I am so happy to hear about this great news. Congratulations. James is an amazing nurturing teacher. I loved the painting that was awarded.